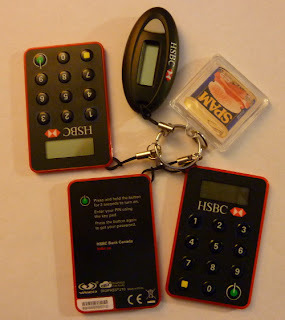 My bank is very concerned about the security of my online accounts, so it sent me these security doozits. They are all real, and each one gives me access to some of my accounts. (Well except the one at the upper right, which is just a key fob.) They would have sent me a fifth one, but for those accounts I had the option of using doozit-like software on my Android device.